What is a contactless dipensing valve and how does it work with my selective robotic conformal coating system? As the name implies, these valves typically operate between 2-10mm from the surface onto which they are dispensing and can apply very small dots or well defined lines and can be used to coat critical areas or discrete components. These types of valves generally work best with materials with some degree of thixotropy and medium apparent viscosities. These valves do rely on unhindered access to the coating area and are most suitable for SMT technology. 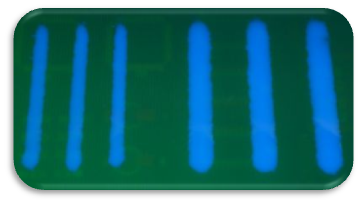 What is the right selective robotic conformal coating system for my material? The robot platform itself, responsible for delivering the valves to the correct location accurately and in an extremely repeatable fashion. A software interface that enables simple programming by an operator, to then control both the robot and the fluid system, to ensure that the coating material is consistently dispensed in the specified locations, and areas required to be left coating free, are indeed left coating free. 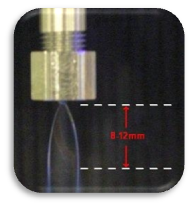 What is an airless, non-atomised film coating valve and how does it affect my conformal coating robot process? This type of valve design relies on generating sufficient fluid pressure to force the valve through a shaped valve opening to form a leaf-shaped fan pattern. What you get, if several other conditions are near perfect, is a wide fluid stream with a well-defined edge as seen in the picture below. 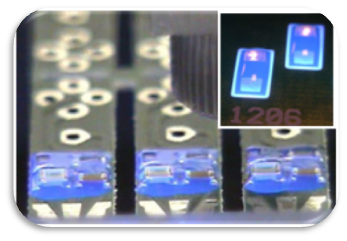 Want to know what is the right valve or valve combination for a conformal coating process? What types of valve are available for robotic selective conformal coating machines? Airless Spray Valves commonly referred to in this industry as ‘film-coat’ valves. LVLP (Low Volume Low Pressure) Atomised spray valves).